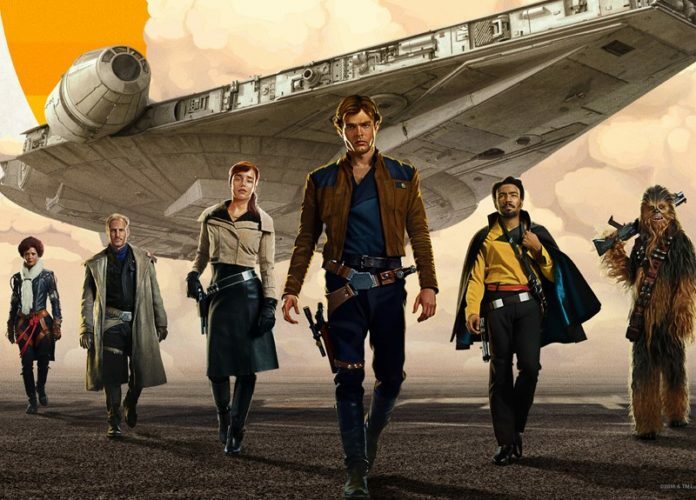 Disney is turning up the promotional heat for the Solo: A Star Wars Story. 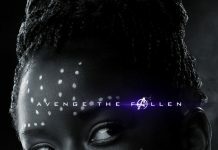 Offering ticket specials and free stuff if you go and see the movie. So far the film has been receiving less interest that usual for a Star Wars film. Which is surprising as Han Solo is one of the most popular characters in the franchise, but then again this isn’t Harrison Ford. 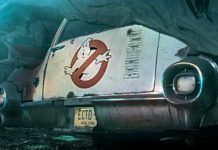 Rumors have been swirling for awhile about the quality, or lack there of, with this film. But other than what we’ve seen in trailers and the fact that they did switch directors, it’s all rumors until it’s released. Or is it? Because it looks like Disney is trying to push hard for Star Wars. The push came very late, which was surprising. I think they just thought if it said “Star Wars” in the title the fish would jump into the boat, but it’s not looking like that’s the case. Let’s look at their “incentives” for getting butts in the seats the first couple weeks of opening. 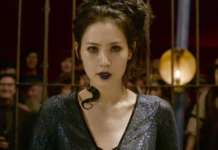 In addition to seeing the film one hour early, fans attending will receive an exclusive poster, novelty buttons and be given a special event-only concession offer. At AMC theaters, fans will also receive replica dice from the film. 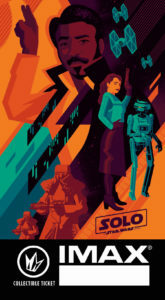 The first two Saturdays after the opening are going to be “Solo Saturdays.” On May 26 and June 2, the first 1,000 who will receive an exclusive ticket featuring art by Tom Whalen. While supplies last, there will also be a poster version available at Regal Crown Club stores. 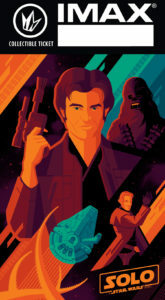 Sunday May 27 and Sunday June 3 guests who purchase a ticket for Solo: A Star Wars Story in AMC IMAX theaters will receive an exclusive print with art by Marko Maney. Here’s the catch, by the way the photos are named I think one is for May 27 and one is June 3, so to get both you have to buy tickets both Sundays. 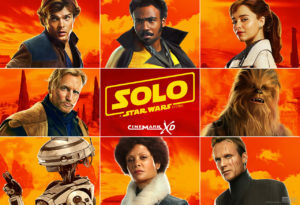 Which boosts ticket sales for Solo. This to me says they are worried. 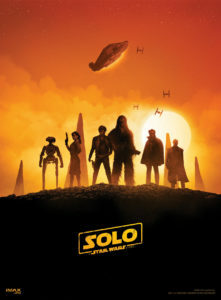 If you go to opening weekend to watch Solo: A Star Wars Story in Cinemark XD (at participating theaters) you will receive a character poster. I love this one! 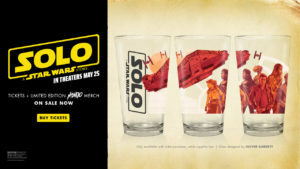 Alamo Drafthouse is allowing and add on, exclusive Solo: A Star Wars Story glass by Mondo, to your advanced ticket purchase. 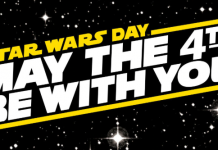 They are designed by Oliver Barrett and feature characters like Han, Chewie, Lando and the Millennium Falcon. This reminds me of the days when you could get Star Wars glasses at places like Pizza Hut. 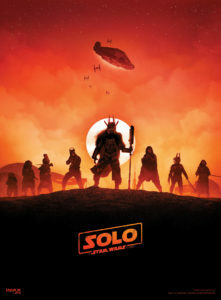 If you are buying tickets through Fandango, while supplies last, you will receive an exclusive poster from the Fandango FanShop. The FanShop is also offering a bunch of Star Wars collectibles to celebrate the “tickets-on-sale date.” See site for more information. 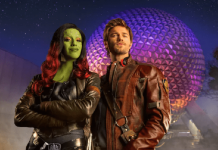 I think Disney knows they need to do something to increase they interest and they hype. Just the name Star Wars on it isn’t going to do it anymore. When I was to Avengers: Infinity War on opening night the packed theater reacted wildly to the Deadpool 2 trailer, but were on their phones, making negative comments, or were getting up to pee during the Solo trailer. I remember when people would go to a movie just to watch a Star Wars trailer and then leave. I’m hoping for the best, bracing for the worst, but either way you can score some cool extras if you are going to buy tickets anyways. 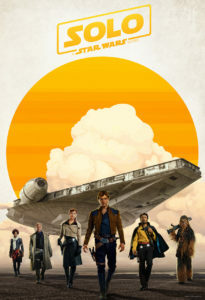 Solo: A Star Wars Story blasts into theaters on May 25.